We’re heading into week four! There are a lot of changes coming with players hitting the disabled list and players behind them getting some extra playing time. Here’s a recap of who were among the top added and dropped in ESPN fantasy baseball leagues during week three and what to do now. My undying love of Chris Johnson pays off in week three as my “predicted pop” each of the last two weeks finally gets added in the ton of leagues, I even talked about him on this week’s podcast. I also did pretty well with “pops” Tony Cingrani, Daniel Nava, and Joaquin Benoit. If you grabbed Johnson I would use him this week on the road against the Rockies and he should get DH at-bats against the Tigers. With Freddie Freeman’s return though, Johnson will soon be back in a platoon with Juan Francisco. Sell high while he’s leading the NL in batting average! Who’s gonna be the closer for Mike Matheny’s squad? Jason Motte seems destined for Tommy John surgery. Mitchell Boggs has been horrendous in 2013 and that might be an understatement. Trevor Rosenthal is an intriguing option, but it looks like the job for now belongs to journeyman Edward Mujica. If he can keep the job for the season I’d expect 30 saves. Grab him while you still can. To quote Randolph and Mortimer Duke from “Trading Places” get in there and SELL SELL SELL! I don’t think he’s remotely this good. He’s a great glove at shortstop, but a career .242 hitter and is already one home run short of the four he hit last year in 435 at-bats. There’s some growth here, but if you can get Derek Jeter’s owner to overpay for him at shortstop or middle infielder, you have to pull the trigger on a trade. 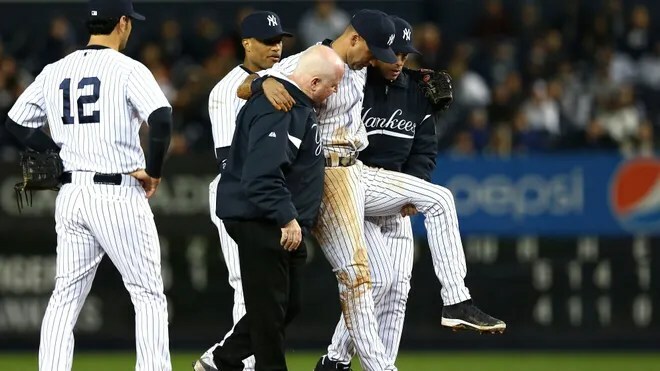 It’s no longer time to hold on to the Yankees captain as his ankle injury will now keep him out through the All-star break. In standard leagues that only have one DL spot, there are better players (Jose Reyes, Jered Weaver, Ryan Zimmerman) for you to be using your DL spot on. Even when he comes back I don’t think we see the player you’re expecting and there will be not as much speed. Just a batting average play at best. The Royals really have a chance to contend this year but Moustakas and teammate Eric Hosmer are going to have to pick up the pace. 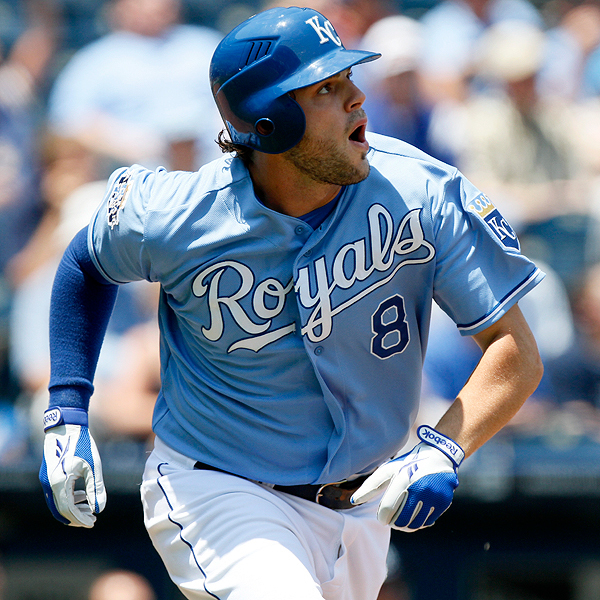 Moustakas is never going to hit for average, but you were hoping there would be a chance at a 25-30 home run season. Instead he hasn’t gone yard this season and has just one RBI on the year. I still slightly believe, so if he’s been dropped in your league, throw him on a watch list as May and June were his best month in 2012. Is there a pitcher that can have one bad start and elicit such a drop-off as Barry Zito? He gets rocked on the road by the Brewers (9 earned runs), but hasn’t given up a single run in 21 innings at AT&T Park this season with 3 wins. He’s a match-up play, but one of my favorite match-up spot starts this season, especially at home. I just wish he could drop under 50% so I can use him for #MapesFantasySpecial’s again. Welcome back! The gang is back this week discussing the many many trips to the 15 Day DL that everyone is taking. Zimmerman, Chacin, Billingsley, etc etc, the list goes on and on. Derek Jeter has also sprung up in conversation as he won’t be back until after the All Star Game. David Ortiz and Chase Headley return from the DL to help their respective teams, and the Brewers get a little crazy stealing first base and throwing water at other players. We also give you your hot fantasy pickups and drops to help you win that office league. Take a listen and start winning! Jeter or A-Rod: Who’s Back First? The Yankees injury hits just keep on coming. The news today is “The Captain” Derek Jeter has a small crack in the same left ankle that he injured during last season’s playoffs and will now be out until after the All-Star break. This is the third setback for Jeter as he originally played in Spring Training to be ready for Opening Day and then had a target date of May 1st. Jeter isn’t the only Yankees superstar on the disabled list until after the All-Star Game. Alex Rodriguez underwent his 2nd hip surgery in four years in January and his planned rehabbed would have him coming back to the Bronx Bombers lineup after the Mid-season Classic. 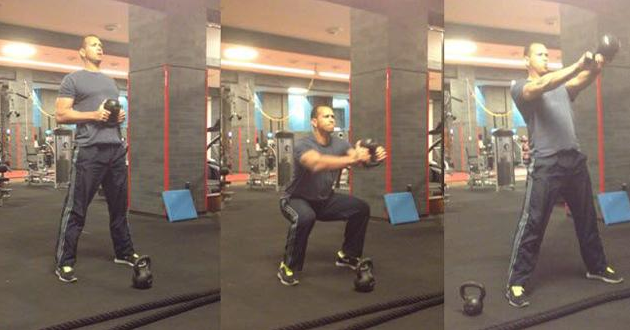 Rodriguez’s rehab seems to be going well, at least from the pictures he posted on his Facebook page. Look at those bulging biceps, they’re ready to go right now. Unfortunately for A-Rod, rehabbing might not be his only problem. He’s under investigation by MLB for his connections to the Biogenesis clinic and Anthony Bosch. That investigation could result in a suspension for the Yankees third baseman that would push back his return into August or further. The Yankees need all the help they can get with Curtis Granderson and Mark Teixeira also out. That being said, the Bronx Bombers are 8-5 this season with the likes of Travis Hafner, Lyle Overbay, and Vernon Wells playing key roles. There’s just something that happens when you put on the pinstripes. The question is simple. Who makes it’s back into Joe Girardi’s lineup first? The Captain or A-Rod? I’m sure some or maybe all of you have heard that Jeremy and I made the top 52 for the MLB Fan Cave in 2013. We’ve been blown away by your support so far and we want to start by saying thank you. Now for the main event! The 2nd annual jersey draft battle! I may have had the worst pick in the draft last year (Adrian Gonzalez, who’s no longer on the Red Sox), but I did score the NL MVP’s jersey (Buster Posey) with the 2nd to last pick. Plus, I got to give grief all season for Jeremy picking Matt Cain 4th overall. The rules are simple: I will pick 1st because Jeremy had the first choice last year. Jeremy will get 2nd and 3rd picks and then alternate from there. What we’re looking for in our jersey investments are quality of player, potential time in uniform, and overall awesomeness. You can only have one player, per team on your own draft. Both of us can pick a player from the same team, for example Matt Cain/Buster Posey and Miguel Cabrera/Prince Fielder were all picked last year. It does play into strategy, because it let me wait on Posey, knowing Jeremy couldn’t take another Giants player. Without further adieu! Last year, I picked Albert Pujols at #3 overall based on the long length of his contract ensuring great use from his Angels jersey. This year, Trout is the most exciting player in the game and is under team control through 2017. Trout’s jersey’s the hands down top pick to me. You’re getting five seasons of sweet-jersey wearing time. Bonus points for completing the Trout ensemble with a foam Trout hat. I might have just let Jeremy get a steal of Pujols or Josh Hamilton later in the draft though, time will tell. You’re up Mr. Dorn. I have a sneaking suspicion you’ll be repeating your top pick from 2012. Two things: First, Mapes is absolutely correct. 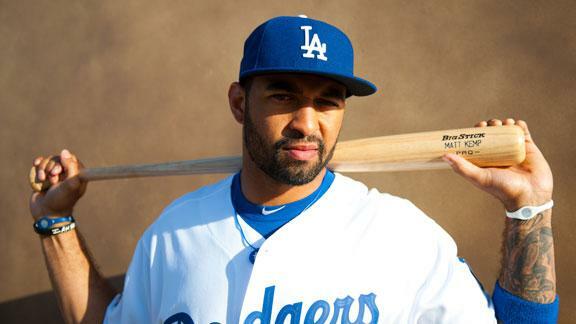 No way I’m not going to take my first overall pick in last year’s draft, Matt Kemp. Not only is he under contract in Los Angeles through the decade, but when healthy he is the best all-around player in the game. Teammates like him, fans like him, and even opponents like the laid-back, uber-talented center fielder of the Dodgers. He came freakishly close to a Triple Crown and 40/40 season in 2011, and will look to return to that form after injuries derailed him last year. Oh, and secondly — give me crap all you want for the Cain pick, but the dude threw a perfect game last season and I hypothetically had that jersey! I snatched this pick off Mapes’ team from last year, and I’m glad I did. Votto has been one of the most consistent, destructive hitters (when healthy) since he entered the league, and will be mashing in Cincy through 2024 under his current contract. 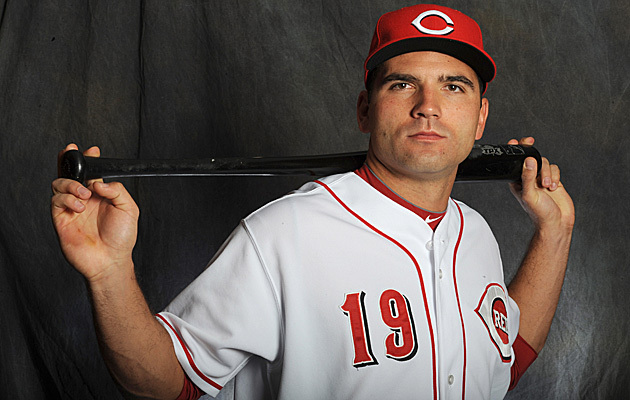 Votto should always be a favorite in the National League for the MVP award, given his batting average, on-base percentage, power numbers and defense in a given year. Plus, the jersey just looks GOOD! There are so many options at this pick it’s ridiculous. I don’t want to talk (or type) out loud and give you any ideas though! I think that Cutch was going to be your next pick so I’m grabbing him now. He’s under team control through 2018, a great player, and completely entertaining as evidenced by his MLB Fan Cave videos. He’s a player you WANT to root for and a baseball fan that has a Pirates jersey when they finally end their sub-.500 season streak will be looking good. That being said, I really hope you don’t take the player I strongly considered here. McCutchen moves up from the #8 jersey overall selected in 2012. Oh, yes I did just pick the J-Hey kid from your own squad! No way I’m letting you stack your lineup with one of the best and most popular players in the game today. 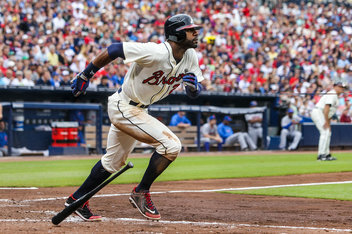 After a dismal sophomore season in 2011, Heyward bounced back to prominence and beyond in 2012, and will be a power-hitting, web gem-making, on-base getting (huh?) beast for at least the next four years in Atlanta. Snag his jersey now, before it’s too late. Mapes, when you’re done crying that I’ve drafted your boy, feel free to make your next pick! WHAT DID I EVER DO TO YOU JEREMY?!?! I’ll have to console myself with the TWO Jason Heyward shirseys that I have hanging in my closet. Don’t worry, I have a plan for my Atlanta Braves pick later. 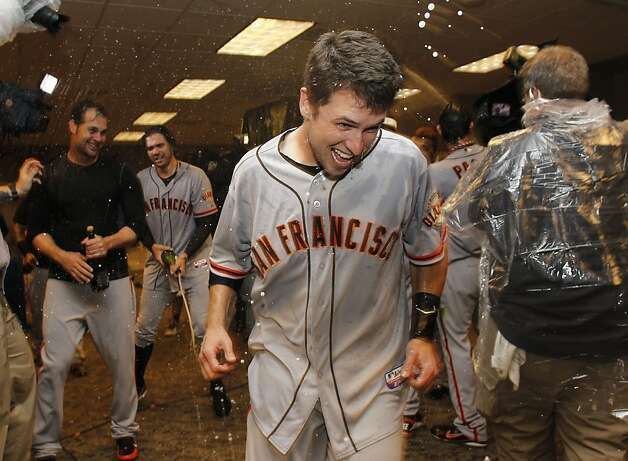 There’s only one real way to get back to you and that’s with a picture of the Giants having a champagne celebration. When was the last time the Dodgers did that? Posey is a great jersey pickup, solid name, defending NL MVP, and safety of knowing he’ll be in the orange and black for a long, long time. Plus, Posey and I are birthday buddies on March 27th! That is a low blow, my friend. I’ll pretend there is just a bubbly leak from the sprinklers in that clubhouse picture. Jones is quickly climbing the chart of all-around athletes in MLB and fans are really starting to take notice. Not only is Jones a graceful defender, but he’s only just starting to fully develop the offensive side of his game at age 27. He’s signed in Baltimore through the 2018 season and is extremely close to breaking into McCutchen popularity territory in my opinion. This is the only orange and black jersey in my collection this year, Mapes! Adam Jones is a solid pick, but I’d rather have a new Orioles hat than a jersey, I think. I’m going back to an MVP I took at #5 last year. Braun is basically going to be a Brewer forever, or at least 2020 seems forever away. He’s been consistently good so far in his career and I don’t think there will be much of a drop off later in his career. It’ll always be cool to wear a Braun jersey, especially in the Badger State. Eight picks in and we have six National League player jerseys…interesting. Given recent news, that pick could become problematic for you. I really hope it doesn’t, and I’ll give you mad props for taking the risk. I’ll continue the run on National Leaguers with the first pitcher of the draft. Of all the exciting young pitchers who I was eligible to select here (remember, I already took Kemp, so Clayton Kershaw was out of the question), I wanted to snag one of the most popular pitchers in all of baseball. Strasburg is a freak of nature on the mound and lights up the radar gun and TV ratings every time he pitches. Not to mention, he’s locked up through at least 2017. Thanks so much for letting me wait and just steal Bryce Harper at the end of the draft. This pick was basically made for me with the news of King Felix’s extension. He’s now the highest paid pitcher in the history of the game, that shows to how great he is. He’s a Cy Young award winner, the face of the Mariners franchise, and you’ve gotta love the King’s Court fan base. Seven years in a Seattle uniform and those trade rumors go away? I’m sure there will be a large influx of Hernandez jersey’s flying off shelves. Let’s just hope they don’t change their uniform scheme. I have a couple of things to say about that pick: First…SO LUCKY! If only that news had broken after you made your pick. Second, the Mariners should never change those awesome uni’s. Anyway, I’m going old-school with the Jeter pick. One of our criteria is length of contract, which will obviously not last forever for DJ. In fact, in the unlikely event that he declines his option for 2014, this could be his last year in baseball. But some players’ legacies live on forever, and this first-ballot Hall of Famer is one of them. His jersey was still the top-seller in all of baseball in 2012, and will be popular for years to come, and not just in New York. 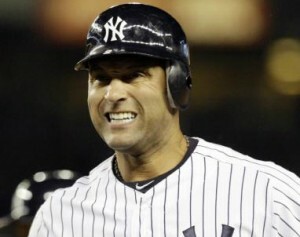 I can’t hate on the Jeter pick even though his time is almost up. The Yankees #2 will join #3, #4, #5, #7, and #8 as timeless jerseys to wear for Bronx Bombers fans. You know who’s time isn’t almost up? 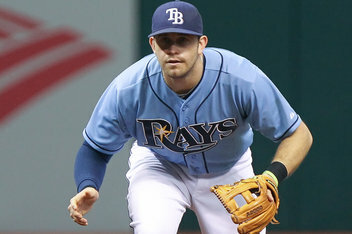 Evan Longoria. The Rays all-star is under team control through 2023. I would type that year in all caps, but the year is numbers. Hmm… he will potentially be a Ray for the next DECADE. There that works. I’ve had a Longoria shirsey for three seasons now, I hope it doesn’t wear out over the next ten. You know what is a formula for success? Besides signing Albert Pujols and Hamilton in successive years, I mean? It’s taking the guy who had MLB’s second-highest selling jersey in Texas last year, and moving him to Los Angeles for at least five years, where his jersey sales will go flying off the shelves again. You’re going to see a ton of Hamilton jerseys in Anaheim this year, and if this draft weren’t hypothetical, I’d be sporting one myself. What’s not the formula for success? You taking your Angel when you could’ve waited until the end to grab him. Plus, I think I take the extra years of jersey wearing from an Albert Pujols Angels jersey over Hamilton, but I digress. Can you believe Starlin Castro is only 23 this season? Seems like he’s already been around forever. He’s under team control until 2020, which also gets you through Castro’s prime. You’ll be singing “Go Cubs Go” in the bleachers for a long time rocking the Castro jersey. Bonus that the Cubs will never really alter their jerseys. Except that the Cubs might still be irrelevant in 2020. Just kidding. Castro is a cool pick, but I’m going with a different shade of blue on this pick. In his return from injury, Joey Bats will enjoy the comforts of a much-improved team in 2013. If the entirety of Canada didn’t already have his jersey, they will after this season when the Jays are sure to be featured on national TV broadcasts as much as possible. He’s signed through at least 2015, and will probably have his option for 2016 picked up by the team. I really want to take Giancarlo Stanton, but his uncertainty in Miami worries me a ton. My final two picks I already have planned out in my head from teams you’ve already taken. That leaves Tulo, who is so talented, but has the injury problems galore. When he’s healthy, he’s an All-star and a potential superstar. He could be in the purple and black for the rest of this decade, so you’ll get plenty use of this jersey. I’ll admit, I was hoping Tulo would slide to me at this pick. 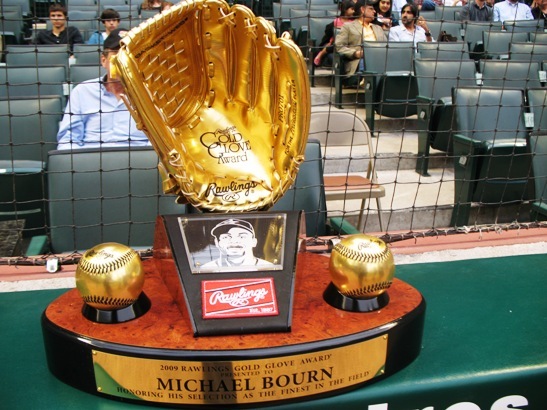 But a very nice consolation prize is somehow grabbing the best overall catcher in baseball this late. The Cardinal jerseys are classics, and Molina is the best all-around player wearing one right now. He had one of the top-selling jerseys last year (probably mostly Cardinals fans), and will be wearing the birds on the bat until at least 2017, likely beyond. He may be one of the least appreciated players in baseball, but I’m showing him some love in the jersey draft for the second straight year! 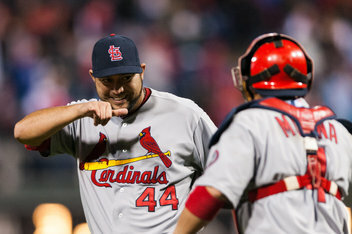 Molina was on my short list, but after what the Cardinals have done to me the last two years I just couldn’t do it. Speaking of team jerseys I don’t want to wear, but I’m going to be objective here. 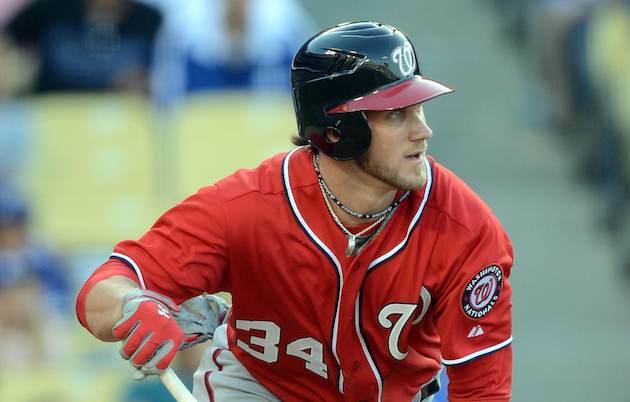 Harper is a future star of the game and will be in the nation’s capitol for three years or more. I’d lean towards the or more part. I don’t like him, but I respect the way he plays the game. It’s a solid jersey for a fan to buy. Plus, I got out of picking David Wright at least? This. Just. Happened. The reason I let you snag Evan Longoria earlier is because I knew I’d have this available to me for the last pick. Myers, the top prospect in baseball, isn’t a sure thing — no prospect ever is. But he’s going to get a chance to play every day for the Rays, who have him under control for at least six years, and will likely lock him up for longer as soon as he puts in a little service time. Judging by the last 15 position players who won Minor League Player of the Year (Derek Jeter, Manny Ramirez, Jason Heyward, Mike Trout to name a few), Myers is going to be a very good player in the Majors, and I’ll be the first to have his pretty-lookin’ Rays on my back. Top that, Mapes! How do I top that? 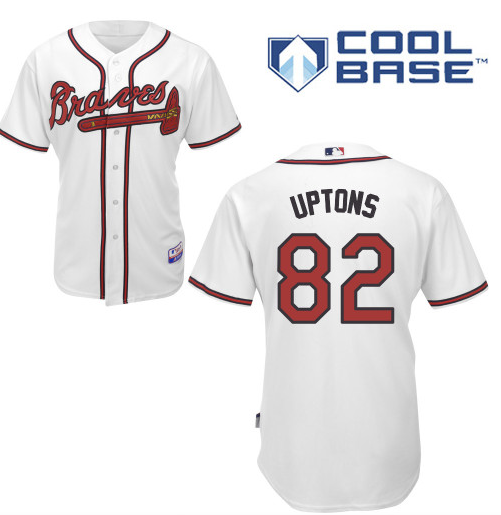 By going with the sweetest custom jersey in Braves history. You get not one, but BOTH Uptons. Special thanks to them for deciding to wear single digits to make this work. I went with the 82 because Justin plays in left, therefore his number goes on the left. This jersey will be good to go for 3-5 years and even if one leaves, just pull off one of the numbers and the S and you’re still set. Truly, saved the best for last! Remember, vote for the 10 jerseys YOU would rather have, not which group makes up the best hypothetical team. Let us know in the comments which jersey you want in your closet! Thanks for reading! You can like Three Up, Three Down on Facebook or follow @3u3d on Twitter! This feels good to say: It’s MAPES’ turn for redemption. It feels good because that means in our two most recent challenges, I have taken commanding victories. After complete and utter embarrassment for Mapes in the Home Run Derby Challenge, and a shellacking revenge story in the Vin Scully vs. Sid Bream Bobblehead Battle II, Mapes needs some cheering up. So this is another chance for him to re-assert dominance in sports predictionism (it’s a word now, okay?) over me. Just like the Derby Challenge, this one will not be left up to the audience. Instead, we will take one pick at a time guessing which players will win Silver Sluggers for 2012 in each league. Similar to our Jersey Draft format, I will take the first pick, Mapes will take the second and third, and we will alternate from there. One small wrinkle this time, though: Once a position has been selected, it is gone. That means if I take Miguel Cabrera as the AL third baseman first (spoiler alert – I will! 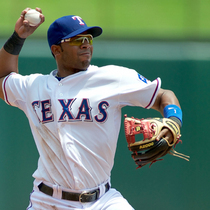 ), Mapes can not later take Adrian Beltre because the AL third base position is already gone. Told you I would take him. Triple Crown, potential MVP, best swing in all of baseball. I really have nothing else to say. This one is a lock. I’m already ahead because you picked first. Enjoy figuring out the NL pitcher Silver Slugger, sucker! My first pick I also believe is a lock. Cano led second baseman in every major statistical category and will grab his 3rd straight Silver Slugger. Ryan Braun put up arguably the best offensive season in the National League, leading in homers (career-high 41), runs, OPS, and total bases. Braun decided to throw in a .319 batting average to boot In my opinion, he’s a lock for his 5th straight Silver Slugger. I’ve already got two in the bank. I’m glad I came up with this challenge. I’ll admit that I originally listed Billy Butler here, forgetting that Encarnacion actually played the majority of his games at DH in 2012. Bad research by me. Yes, Adam Dunn always has a case here, but he hit .204, and struck out approximately 598 times. With the breakout season Encarnacion had (.280/42/110), it would be a monumental travesty if he didn’t win the DH Silver Slugger. Butler is in the discussion at designated hitter, but I agree that Edwin Encarnacion, who started at DH more than any other position, does get the Silver Slugger there. Adam Dunn has a chance too if they just fall in love with his home runs. Too early for that kind of risk, in my opinion, but I respect your guts. I’ll go with another lock on my board with Mike Trout, who hit .325, blasted 30 homers, and led the American League in runs scored. Easy call, I’m 3 for 3 guaranteed. I was a little bit unsure about this pick, simply because there were a few other hot-hitting catchers in the league this year. 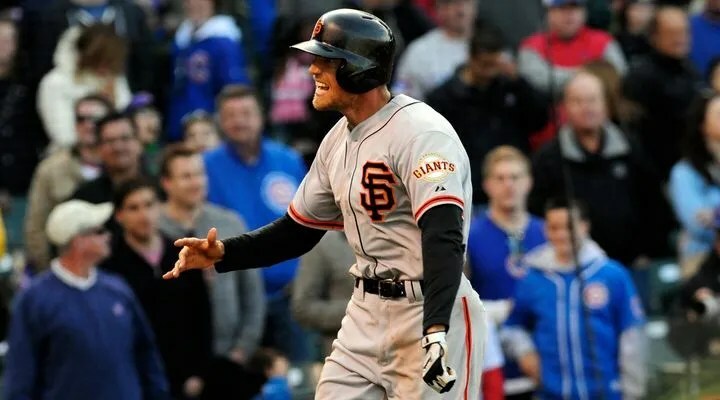 While Posey is the leading MVP candidate in the National League, you can make a pretty good case for Yadier Molina, Wilin Rosario, or even Carlos Ruiz. After Posey’s scorching second half and huge grand slam in Game 5 of the NLDS, I have no doubt that he will get the vote for Silver Slugger. Look at you redeeming yourself. I thought about taking Posey at five, but the Yadier Molina risk with Trout still on the board made me pass. 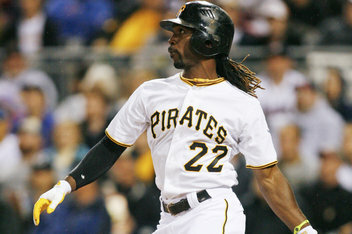 Instead, I’ll go to the 2nd National League outfielder on my list in Andrew McCutchen. Cutch led the NL in offensive WAR and was tops among N.L. outfielders in batting average (take that Melky). The Pirates star also led the senior circuit in hits, which I think make him a lock for his first Silver Slugger. That’s right, I’m calling all FOUR of of my picks so far LOCKS. Look at you thinking all your picks are “locks.” That’s cute. This pick here is a lock – Desmond was by far the best offensive shortstop in the National League this season, helped by the fact that Troy Tulowitzki was injured. Even if Tulo was healthy, it might have been a tight race. Desmond really busted out in 2012, posting career highs across the board (.292/25/73) and the only guy who comes close to matching him is Jimmy Rollins, who hit .250 with less homers and RBI. Desmond is a lock? We’ll see what Jose Reyes, Rollins, and Starlin Castro have to say about that. This one might not be a lock, but why should I go against a player that led the American League in hits? Who else are they going to give it to? Alcides Escobar? Ben Zobrist? (Not sure he would qualify there) Elvis Andrus? This would be Jeter’s first Silver Slugger since 2009. All those guys will be saying is “Congratulations, Ian!” I do, however, think Jeter will be congratulating J.J. Hardy at season’s end. My pick here is a tough one, because the third base position in the National League is stacked with pretty good candidates. Headley won the NL RBI title and was huge in the second half. Regardless of the team he plays for, I think coaches and managers will remember the type of season Chase had in 2012 when it comes time to vote. J.J. Hardy? Hardy finished 18th at shortstop on the ESPN Fantasy Player Rater. A.L leader in hits or dude who hit .238? I’ll send you a J.J. Hardy shirsey if he wins. David Wright has a better chance at stealing Headley’s Silver Slugger than Hardy stealing Jeter’s. I’ll continue my run on the outfield awards and I think getting Josh Hamilton here is a steal. He’s clearly one of the top three offensive American League outfielders hitting .283 with 43 homers and knocking in 128 runs. I love this pick, I would date this pick if I could. Hamilton definitely was a top three hitter in the A.L. outfield, but will he get the vote with people like Adam Jones, Josh Willingham and Curtis Granderson also in there? We shall see. I feel totally fine calling this pick a lock, considering the usual suspects (Dan Uggla, Brandon Phillips, etc.) can’t hold a candle to the numbers Hill (.302/26/85) put up this year. He hit for the cycle twice in one week. That’s EPIC! True story, I like A.J. Pierzynski’s numbers and that makes me not too confident here. True story, no one likes A.J. Pierzynski which makes me confident in this pick. Mauer was 4th in the A.L. in batting average and led the league in OBP. Good enough for me to give him his 1st Silver Slugger since 2010. Plus, he led me and Lindsay Guentzel to a fantasy baseball title. Love that guy. P.S. loved that Aaron Hill pick. You know what? Even if I lose this contest, getting props on the Hill pick from you is a victory in itself. See, good sportsmanship people! The National League first base crop definitely got weaker with the defections of Albert Pujols and prince Fielder to the A.L. and the injury to Joey Votto. That being said, I like LaRoche (the only NL first baseman with 100 RBI) to get the vote over guys like Freddie Freeman and Paul Goldschmidt. LaRoche hit .271 with 33 homers and 100 RBI. It took us forever to go to first base, but might as well knock them out back to back. Fielder had the most consistent season at the position hitting behind Miguel Cabrera. Pujols is in the mix, but the voters could still remember his slow start. Fielder finished 6th in batting average ( a career-high .313) and 5th in RBI in the American League, while hitting 30 homers for the 6th straight year. The middle of the Tigers lineup is crazy good, huh? Even though his own teammate, Matt Holliday, had better overall numbers, I think Beltran has earned the votes of managers and coaches across the league. You would be hard pressed to find an opposing team who didn’t get burned by Carlos Beltran heroics at some point in 2012, and I doubt that it will be forgotten when tallying votes for Silver Slugger. Beltran finished with a line of .269/32/97. The middle of that Cardinals lineup is crazy good, huh? You stuck me with A.L. outfielder? Let’s see if I can nail all three with Trout, Hamilton and now Adam Jones. There are a couple of other options with Alex Rios, Curtis Granderson, and Josh Willingham. However, I think that the story of the Baltimore Orioles will carry Jones to his first Silver Slugger. They already snubbed Willingham for the A.L. All-Star team, why not for Silver Slugger too. At least I gave him a 10th place MVP vote. Good luck picking the right pitcher for a Silver Slugger! I figured I’d give you a shot at sweeping the outfield in the American League. You’ve got a lock on Trout, though I think Hamilton might get upset, and you never know about that third spot. As for N.L. pitcher, this was easier than expected. After crunching the numbers, it came down to Leake and Stephen Strasburg. I’m sacrificing a probable winner by taking Leake, because Strasburg has the name recognition (yes, even among coaches and managers) that Leake doesn’t. But I must point out so the world knows: 18 hits, .295 average, 2 home runs for Mike Leake as a pitcher this year. Give him the Silver Slugger! Who do you think will be taking home some fancy Silver Slugger awards? Let us know in the comments!